The images below are thumbnails. Click on them to see a larger version. 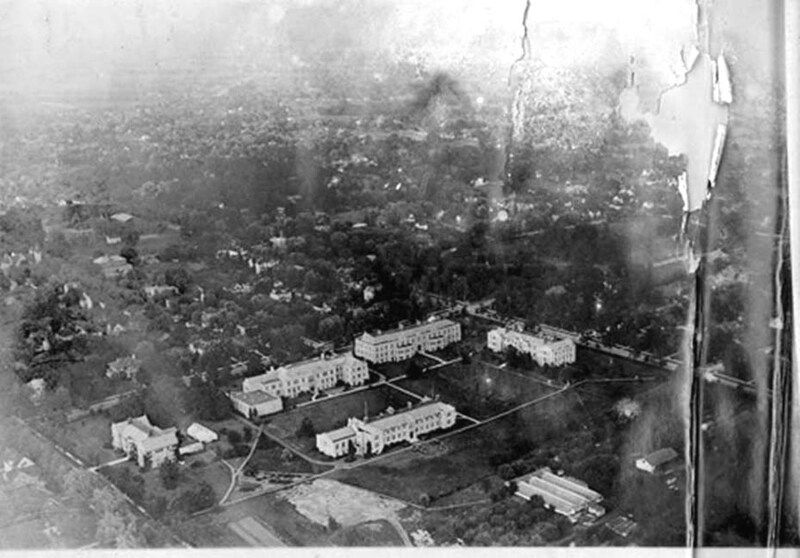 The images on this page are part of a scrapbook compiled by 1920 MU Civil Engineering graduate, Warren G. Fowler. The scrapbook is part of a larger collection of Fowler's student memorabilia within the holdings of the University of Missouri-Columbia Archives. The entire Fowler collection is available to patrons in the reading room of the UMC Archives (#703 Lewis Hall). 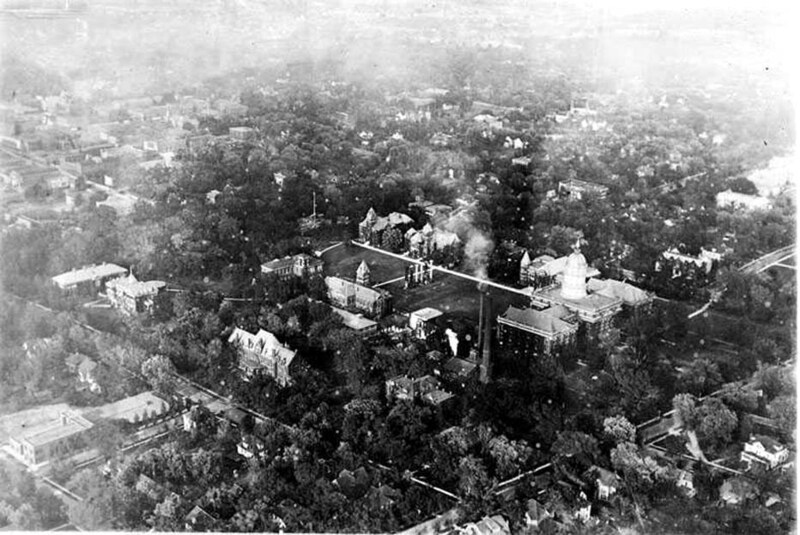 Fowler provided accompanying descriptive text which explains that the photographs are, "Airplane views of the University of Missouri and Columbia. 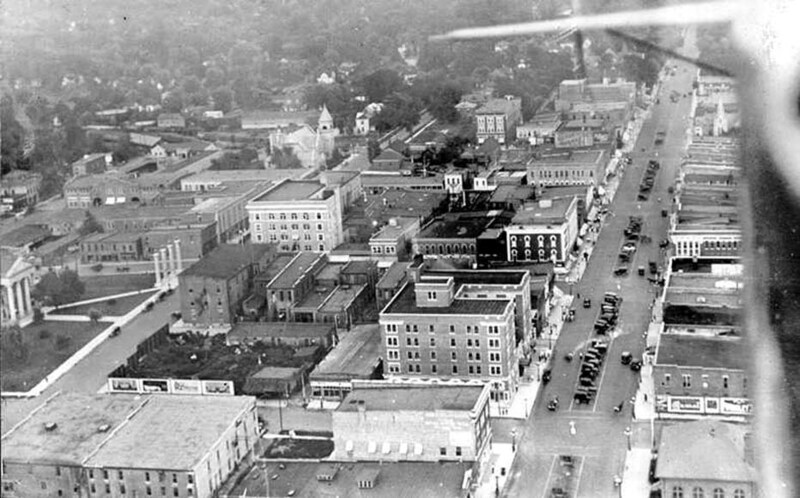 Taken Sept. 1919 from Fred Neidermeyer's airplane." Sadly, he adds that "Neidermeyer was killed in an airplane accident in the Spring of 1922." 1. The University's White Campus appears minus several accustomed structures, only a bare patch of ground marks the spot where Green Memorial Chapel and the Memorial Union and Tower now stand. 2. Fowler's caption for this photograph reads: "Going west over Broadway." Many familiar Columbia edifices are recognizable, including a portion of the Boone County Court House, on the extreme left. Part of the fuselage and tail of Neidermeyer's aircraft can be seen on the right. 3. In this photograph, UMC's Red (West) Campus is a mixture of the familiar and the seemingly out of place. 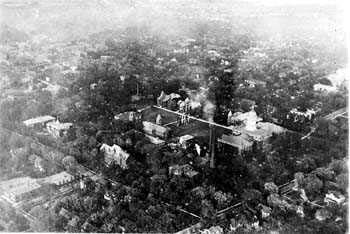 Well-known buildings, such as Jesse and Switzler Halls share the space with long-vanished structures such as the old power plant (just west of Jesse Hall) and Lathrop Hall (on 6th street where Engineering East is now located). The detail enlarged at the top of this page was taken from this photograph.